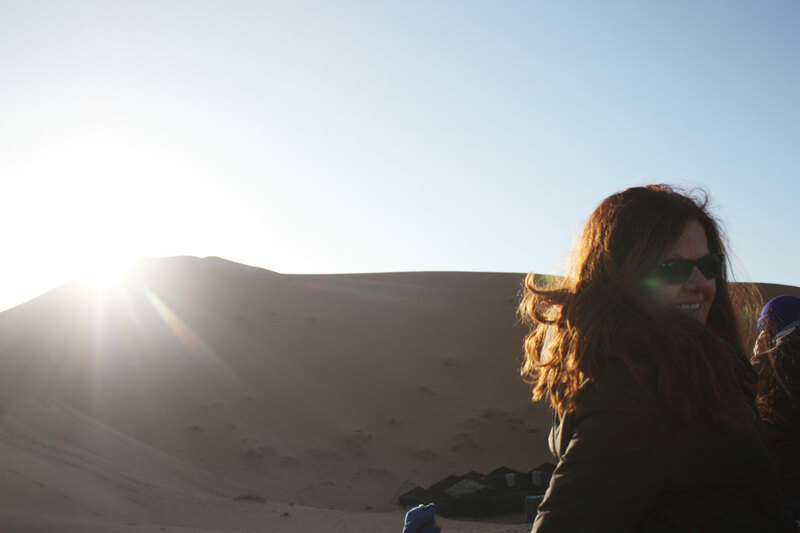 I went to Morocco last week to play Lawrence of Arabia and ride a camel. What I found instead surpassed my expectations and was far better than I could have designed. To see the origins of how this adventure came to be , you can read about it here. I left Pisa at 6:00 am, blurry eyed, and sat next to a lovely young American woman, Stephanie, who is currently living and working in Florence. 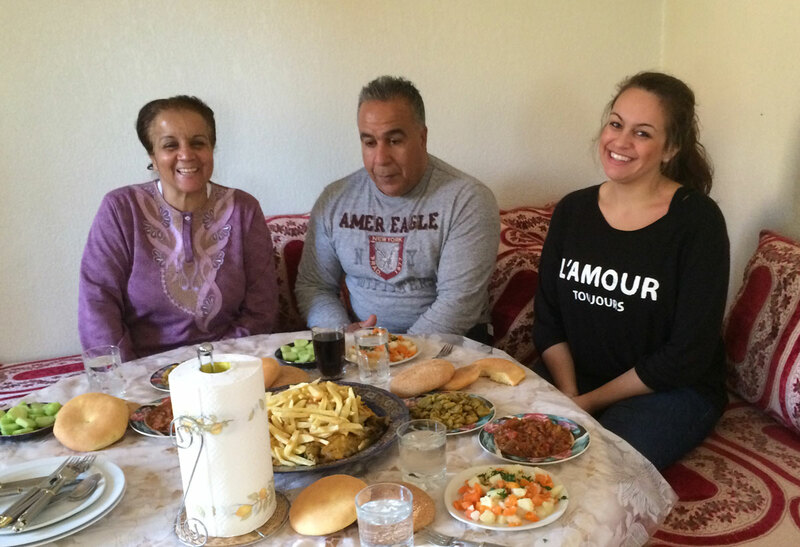 I learned she is one half Moroccan, her dad is from Marrakech and she has grown up there visiting family for vacations. She is on her way to see her Dad today. We have a great chat, we exchange cards and make a vague plan to meet later that evening. 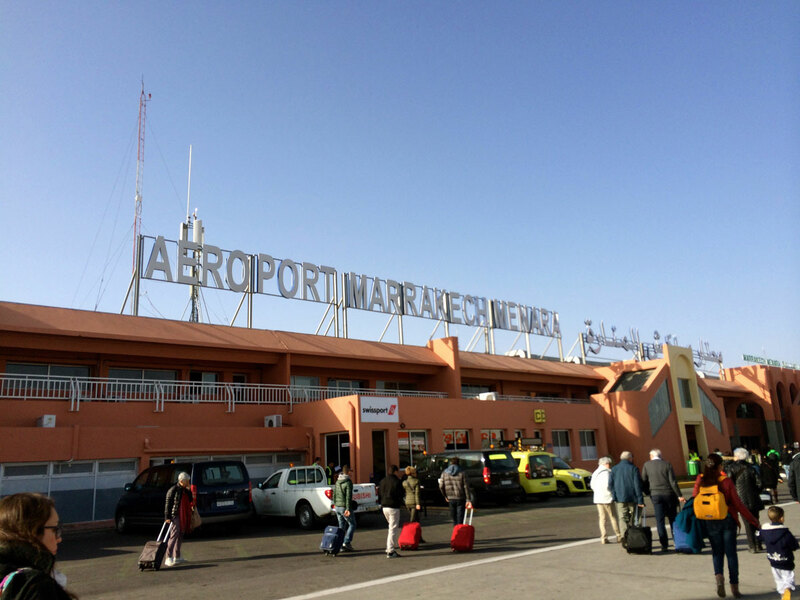 We arrive at Marrakech airport, her Dad whisks her away after graciously offering to drive me to my Riad. I have to refuse unfortunately, since I had arranged for taxi service before hand. My driver appears and transports me in minutes into the heart of the Medina , in central Marrakech. I am transported to another world, total and utterly, wonderfully chaotic, authentic , gritty and real. 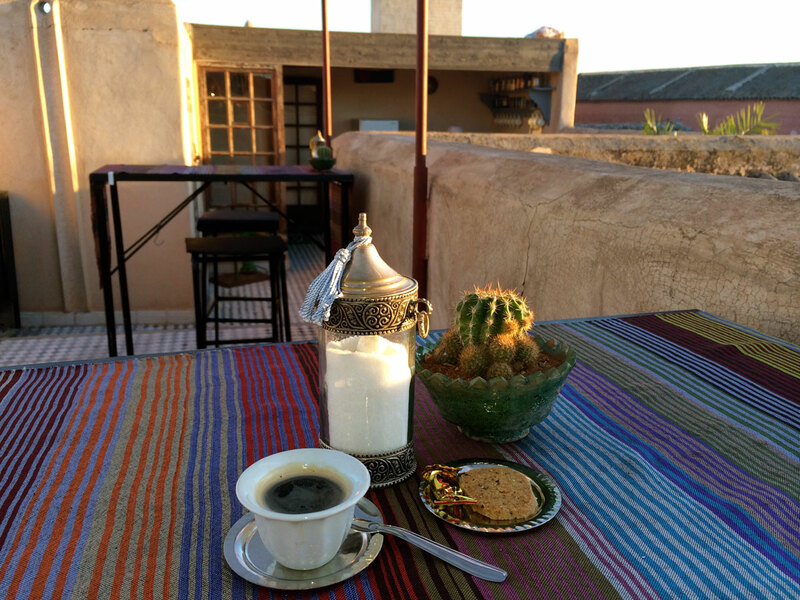 My Riad (kind of a B and B, organized around a central courtyard) is lovely and owned by an transplanted Italian woman from Tortona, named Lucrezia. 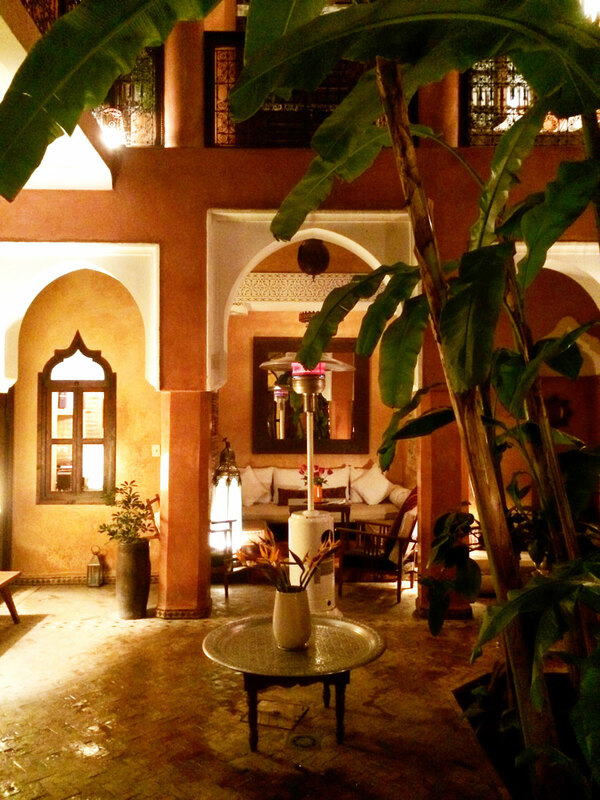 Her Riad, Dar Attamjil is exquisite, she restored it and designed it herself 12 ish years ago, and it is a jewel. 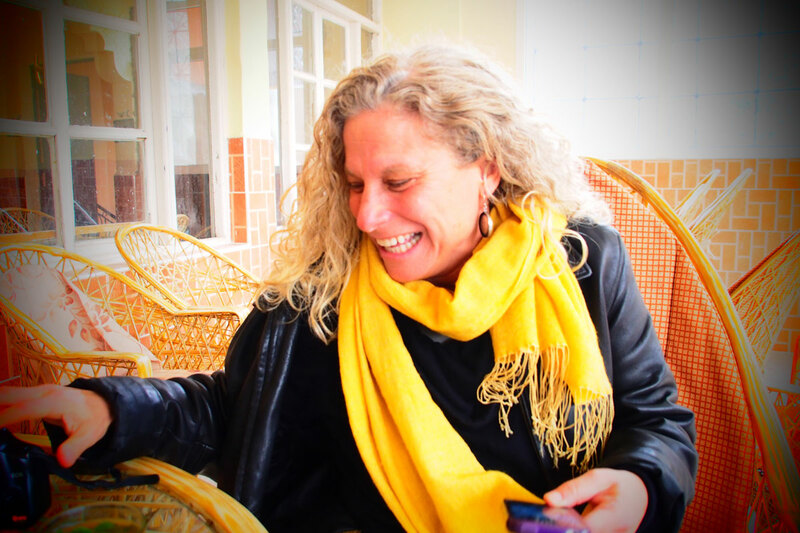 I ask Lucrezia about things to do and places to see in the Medina, and good shopping of course. I know she will steer me in a good direction, since her taste is impeccable and right up my alley. 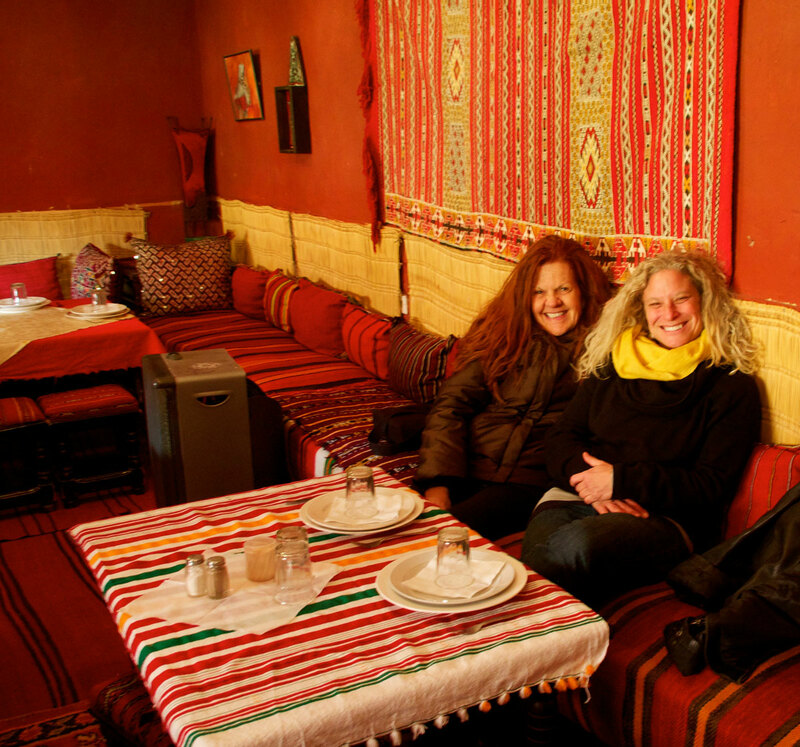 She gives me a list of places not to miss, and takes off to her organic farm and other hotel in the Atlas mountains, LALLA ABOUCH ORGANIC FARM, I will need to go here next time. It looks amazing. 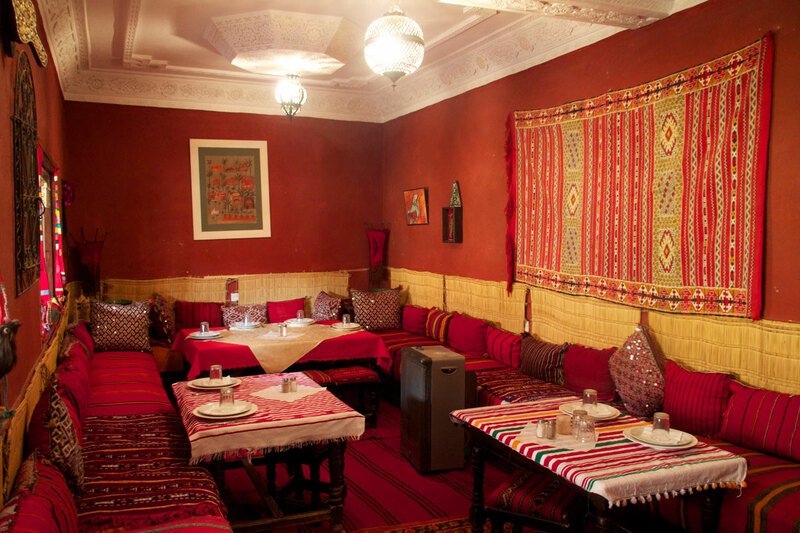 If you find yourself in Marrakech, do not miss the Dar Attamjil, it is wonderful. No sooner do I check in when Stephanie from the plane phones me. Would I like to come to lunch in 15 minutes at her aunt’s house with her and her Dad? Would I??!!! They arrive to find out her Dad grew up in this neighborhood and this Riad was owned by one of his family members before Lucrezia bought it. Small world. 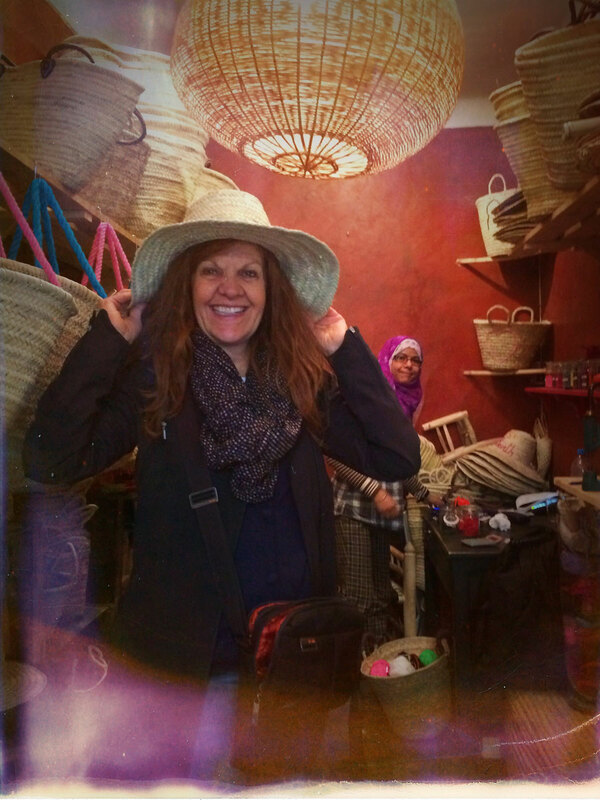 They whisk me off to a mini tour of the Medina and I am overwelmed in a good way, and dazzled. 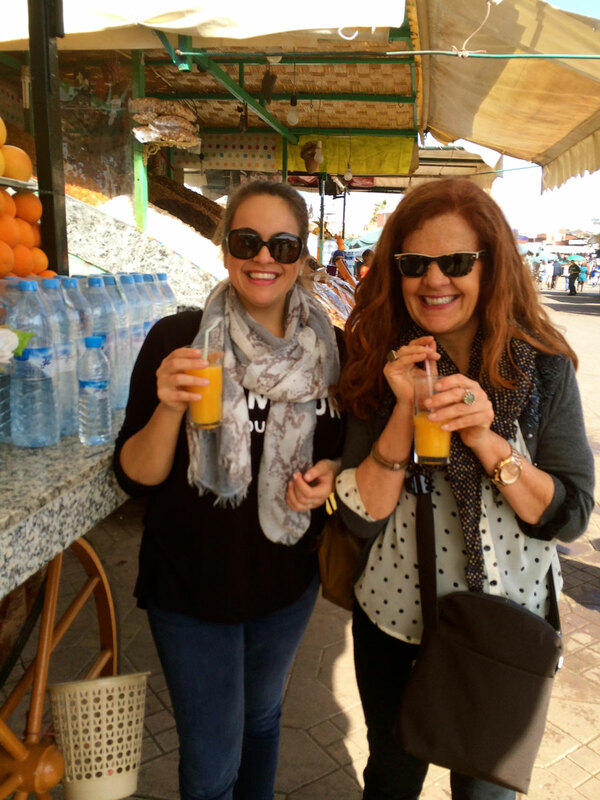 We get fresh orange juice at the Jemma Square, the center piazza type situation where its all happening. The juice is the best I have ever had. A bit more touring and lunch is calling us. We arrive at Stephanie’s aunt’s home, who has spent the day cooking and I have my first meal in Morocco, and home cooked no less. Fabulous! Chicken tagine, salad, and all sorts of other delicacies. I am so appreciate of this family’s hospitality, it was so gracious of them to invite me. After dropping me off later that afternoon at Lucrezias, I have a few hours left of daylight. Barb, my long time friend and traveling companion is not due in to meet me until midnight. I head for the first of the best shopping on Lucrezia’s list. Atelier Moro, an exquisite boutique owned by a Columbian woman, Viviana. 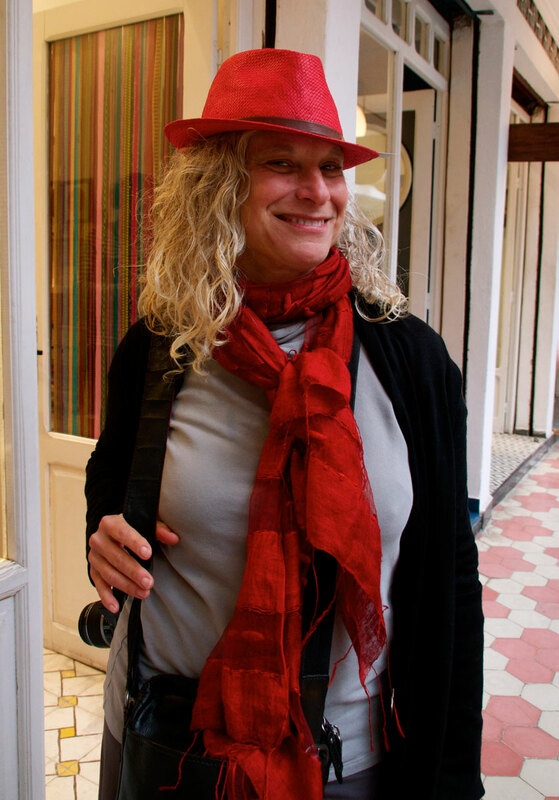 The store is like a mini Urbino, but Morocco style: home furnishings, clothing, and jewelry. I enter her store, am greeted by her employee and transported to the magic of this place. I notice a woman over by the wrap desk, talking to another customer. This has to be Viviana. She has an owner’s vibe. I can always tell. Do I say something to Viviana? Do I tell her Lucrezia sent me? What will she do? I take a deep breath and introduce myself. She lights up and invites me for a coffee on her rooftop terrace. She will join me shortly. This is what I climbed upstairs to. Heaven. Perfect espresso and Moroccan cookie. Sun setting over Marrakech. Viviana comes up, we chat, turns out she loves Italy, she has been in Marrakech for years but goes to Italy when she can. She is coming there soon to see friends in Tuscany and also happens to mention that she is trying to obtain concert tickets to see Sixto Rodriguez, who is playing in Milan in March. Have I heard of him? She confesses she is crazy about him. I have a near heart attack. Rob and Corey led me to the documentary about this obscure singer’s (until recently) life and music. He is INCREDIBLE. You can see the trailer to the film here. She has not found tickets yet, the concert is sold out, nor has she found anyone to be nuts enough to jump off the ledge and go to any lengths to go see him perform in Milan at a sold out concert. Well, until I entered that day of course. Obsession and tenacity are my 2 best and worst qualities. In this case, best. We open up her Mac Pro and begin the hunt for Rodriguez tickets. A couple of hours later with a lot of false leads, we strike out, but remain positive that we will find them. We promise to each keep trying and we will see each other to confer in a few days after I return from my camel ride in the desert. SIXTO RODRIGUEZ in Milano! How exciting is that. Good for me that I ignored the 14 year old that came to visit earlier. Phew. 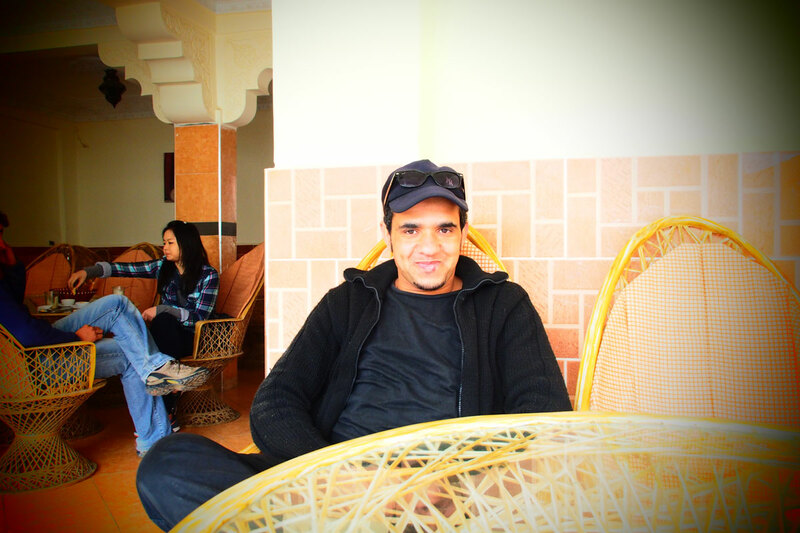 I return to Dar Attajmil and go to sleep early. I was in Pisa this morning. Barb straggles in at midnight but I don’t bother to greet her. I will see her tomorrow. Next day we awake to a fab breakfast , talk for hours catching up like good friends do and decide what to do for the day. A visit to the Medina and the Souks is in order. I also need to find a hat for the desert. 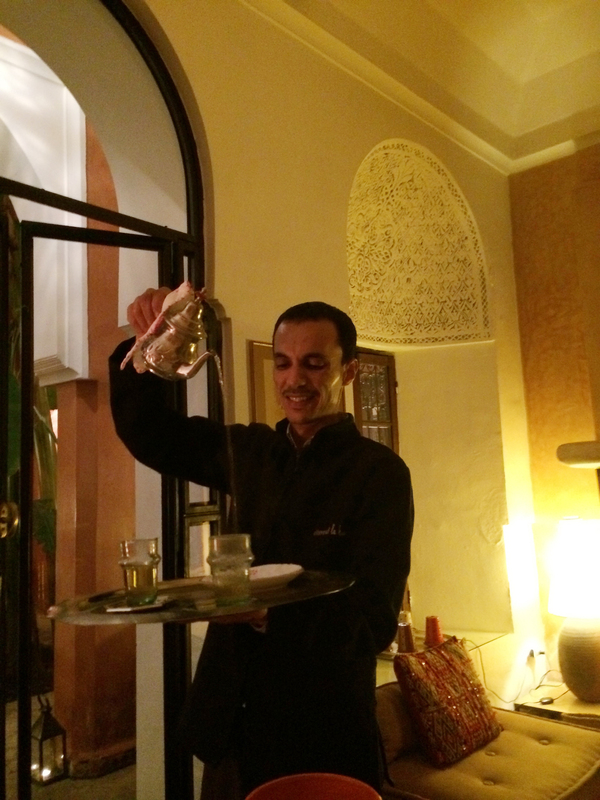 Later we book appointments to have a Hamamm and massage back at the Riad. More on that later. Shopping calls. Just a few of the many sights we encountered that day. 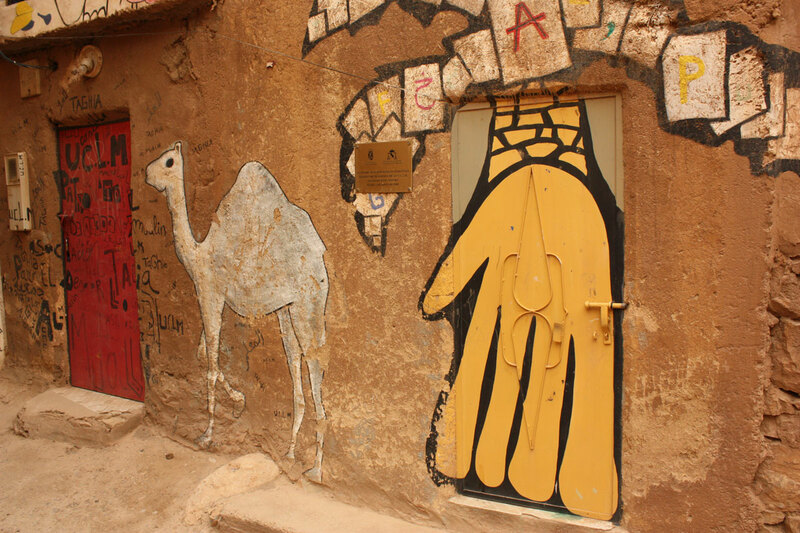 We arrive back at the Riad at 4 pm, ready for our Hamamm. We enter a heated sauna type room and a lovely woman has us lie on benches and proceeds to pour warm water over us and scrubs us down with various aromatic salves and ointments all designed to open, relax and such. It is wonderful. However, I am getting increasingly nervous that these endless buckets of water are rapidly approaching my hair, which I have just had colored and laboriously curled by Mino and the gang at Prive, in Arezzo. I have counted on not having to wash my hair for a week. I did not even bring product to curl and style! This is a crisis that must be adverted. But I want this woman to like me. I can’t tell her not to pour water on my hair can I? My need to people please outweighs my need for the good hair days ahead, so I surrender to the process. The first bucket of water hits the head. Sharp intake of breath. Then I float in a luxurious free feeling. How wonderful to LET THIS GO. I continue on to enjoy this experience and the subsequent massage. Delightful. Barb and I order dinner to be cooked for us by the ladies and it is pampering of the highest order. They serve us a delicious meal by the fire, Mohammed serves us tea, and we have the perfect evening before our 3 day adventure to the desert tomorrow. The hair doesn’t even look half bad, considering. Next day, Brahim, our guide for the next 3 days picks us up at 8 am sharp. He is a gem, a treasure. He greets us with warm big hugs and we fall easily into a wonderful harmony and connectedness with him, he is funny , smart, respectful , knowledgeable, kind of nuts in the best of ways, and we love him instantly. We are so lucky to have this man as our guide and friend over the next few days. 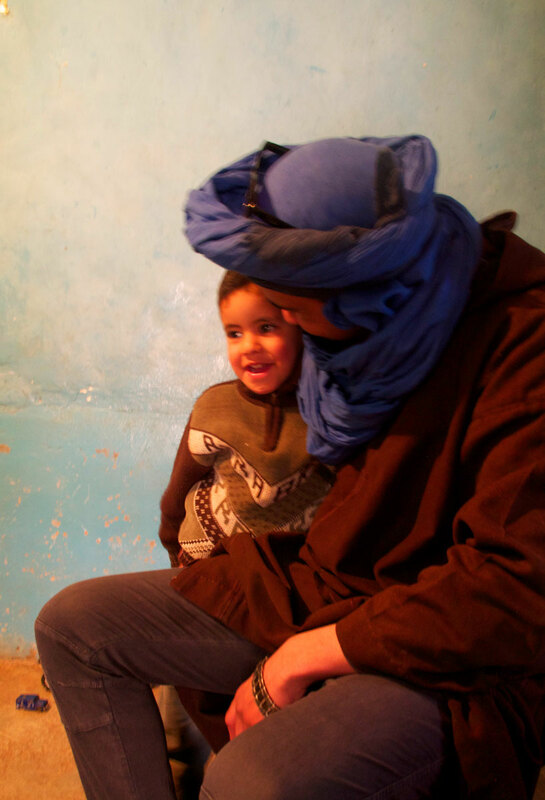 Brahim is Berber and grew up near the Dades Gorge, hours from Marakech. Something in him made him decide to take us home to meet his family. Trust factor is in operation here. 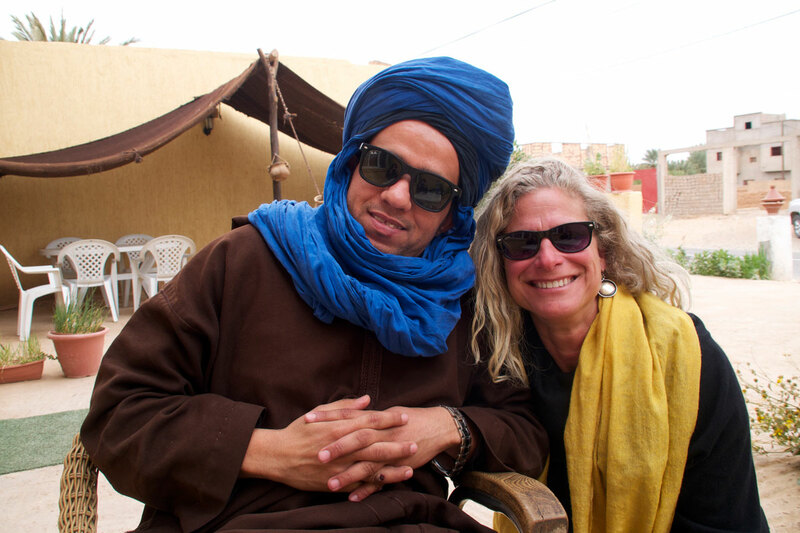 Brahim and his mom, the beautiful matriarch of this family. We are served tea, bread and olive oil by his sisters and cousins they are delightful and speak a little French so there is much gesturing and such. They are lovely beyond belief. I am over welmed at the kindness of this family and the hospitality they offered us. Many photos and cups of tea later, Brahim transports us to our hotel nearby. Next day he arrives in desert wear. I want to wear a turban too. It is a good look. 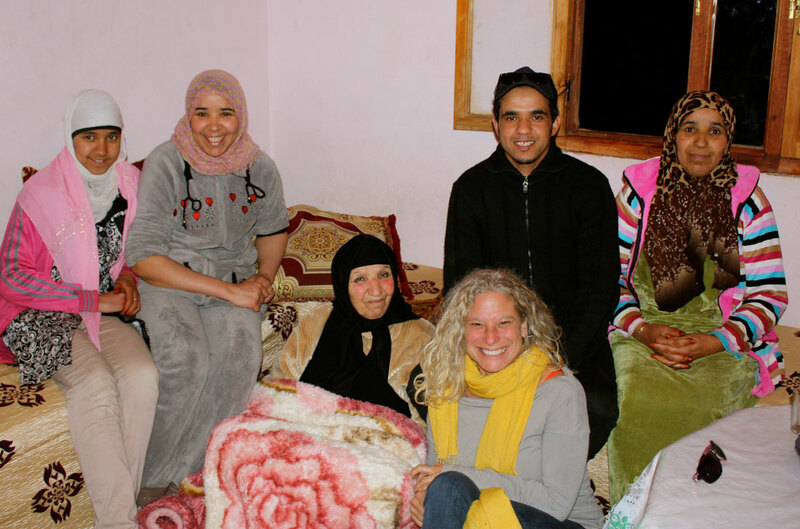 Before we set off to the desert, Brahim makes one more family stop to see his other sister and her family. Barb and I fall in love with the son, Brahim’s nephew. I am reluctant to leave, so touched by this family’s warmth and kindness. But leave we do, onward. The tour dictates that we see certain things at certain times. Like lunch. 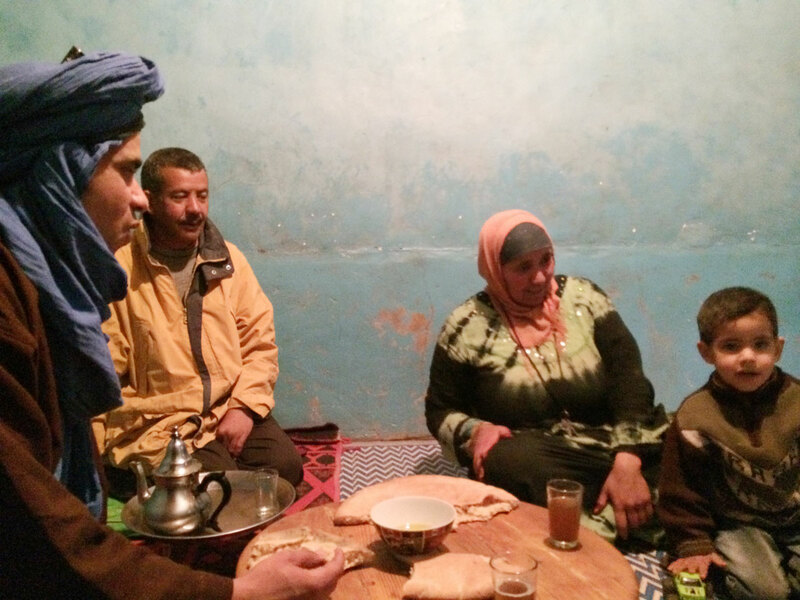 Brahim quickly learns that we prefer the non tourist places, where Moroccans eat. We have wonderful meals. I am ready to move in here. 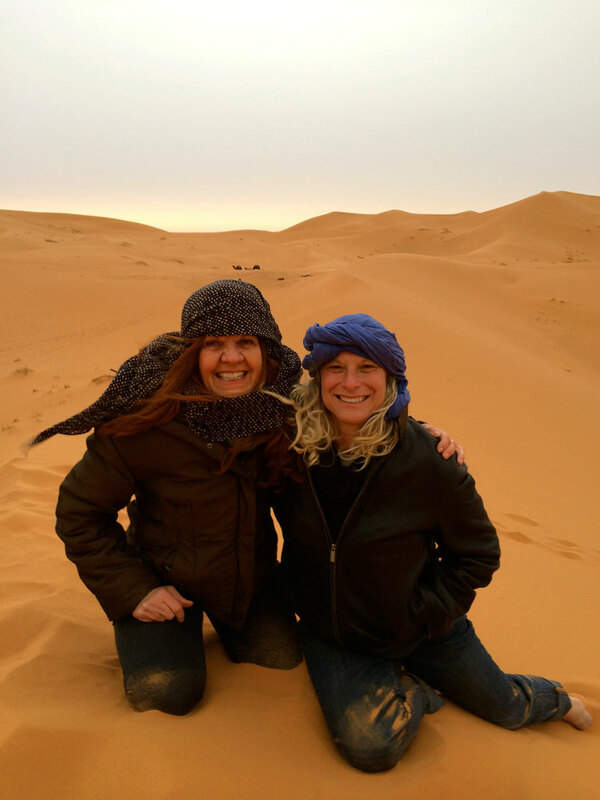 We finally arrive at the edge of the Sahara desert for our camel trek. I insist on the turban look. Brahim is happy to comply. Yup, there we go. 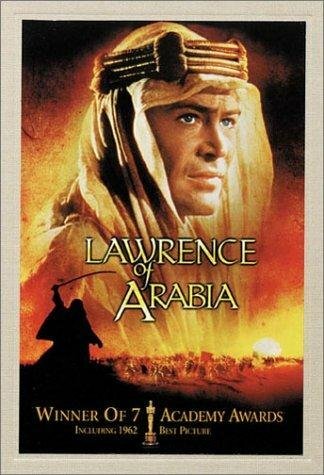 Lawrence of Arabia. 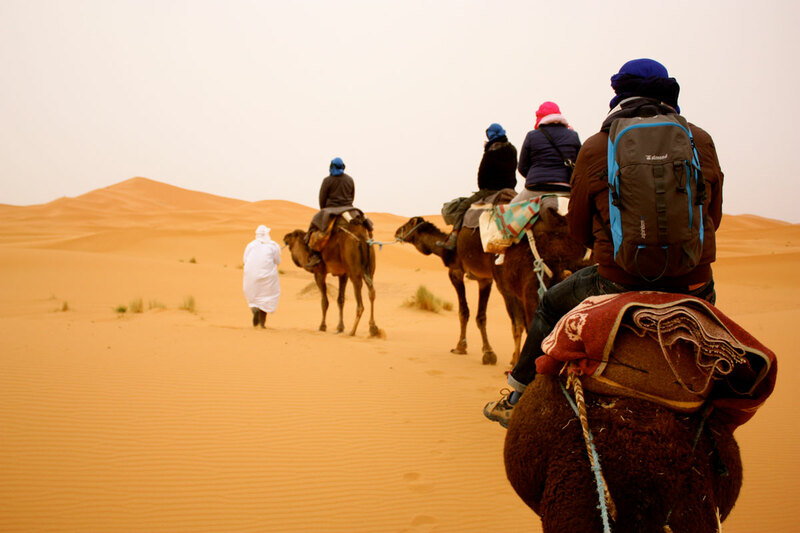 We trek into the desert, camel riding is not unlike riding a horse, easy. 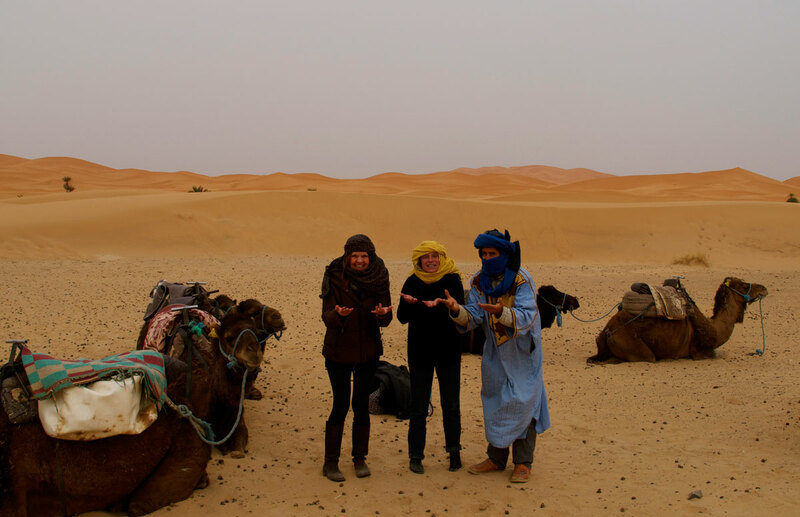 It was fun and the Sahara desert is everything you have ever seen in photos. Magnificent and endless as far as the eye can see. So still and quiet. We arrive at our tent enclave a while later, and it is so tidy and nice, there are several tents clumped together and about 14 of us in this group. They show us to our respective tents which have real beds and tons of blankets, and even an outhouse. We are NOT roughing it at all. There is a dining tent where they will be serving dinner later , but now we are told to go explore, and watch the sunset. Unbelievable. The moon rising over the Sahara Desert. I am glad Barb pushed for this. 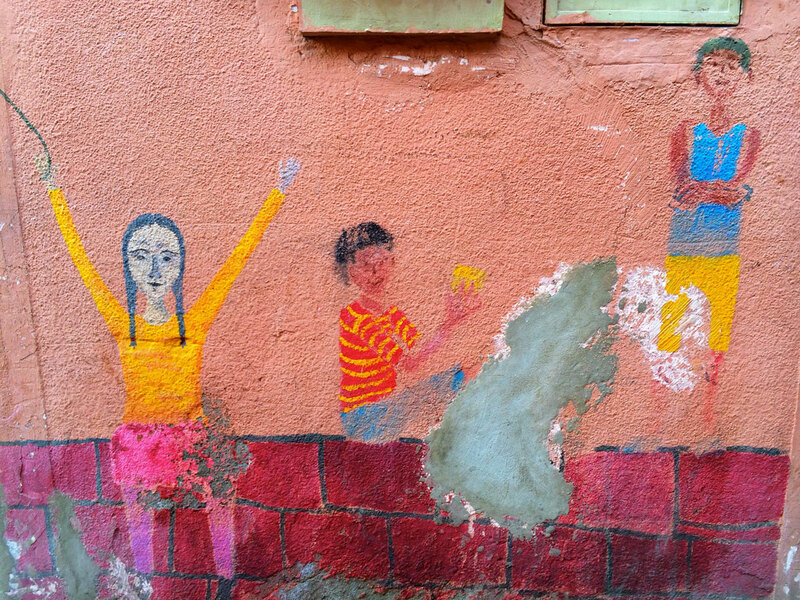 India, Germany, Italy, France, New York, Japan, so much fun. 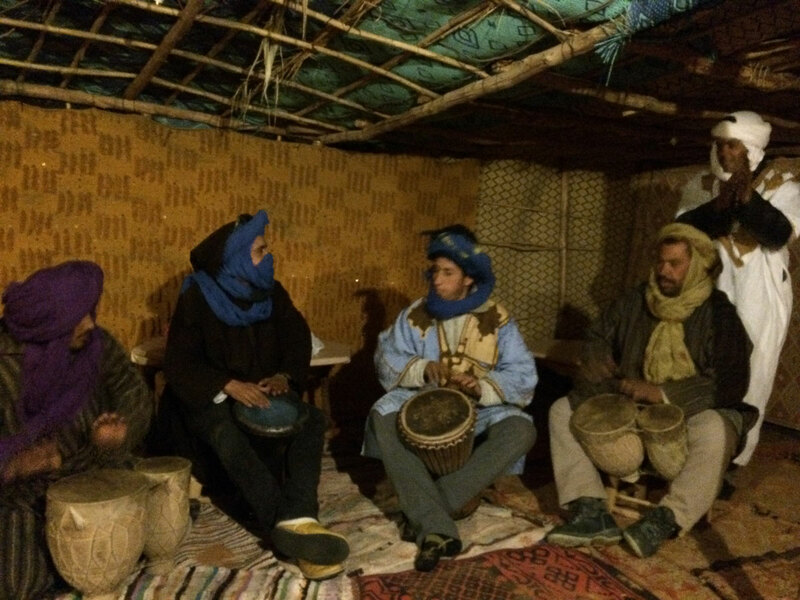 Our guides play music after dinner, we all try our hand at drumming and subsequent dancing, It is rhythmic and hypnotic. I could do this all night. But the stars call and some of us trek up to the dunes to star gaze, I hang with Mohammed, who shows me the Little and big Dipper (Moria, you got that?) and tells me about his life growing up in the desert. Amazing. I would love to really go for days into the desert and see explore further, there is so much vastness out there and I’ve not experienced anything like it. We are awoken the next morning at 6 am to go watch the sunrise. Another marvel. Over way to soon. A place to come back to surely. Mohammed and Barb. 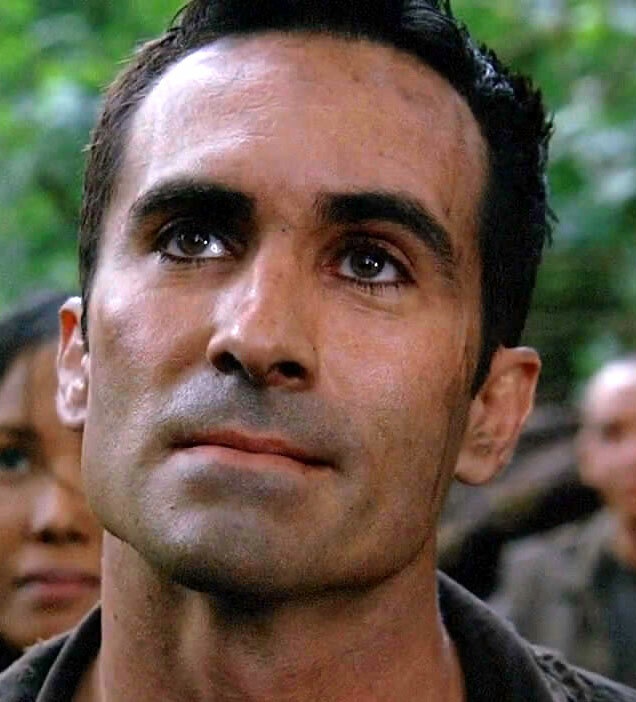 Mohammed is the Moroccan double of the Richard Albert character in the TV series LOST. Under the eye liner and everything. I am convinced they had the same mother. Or father. Sure of it. Our desert trek sadly comes to an end after another trek on the camels back to where we started the night before. 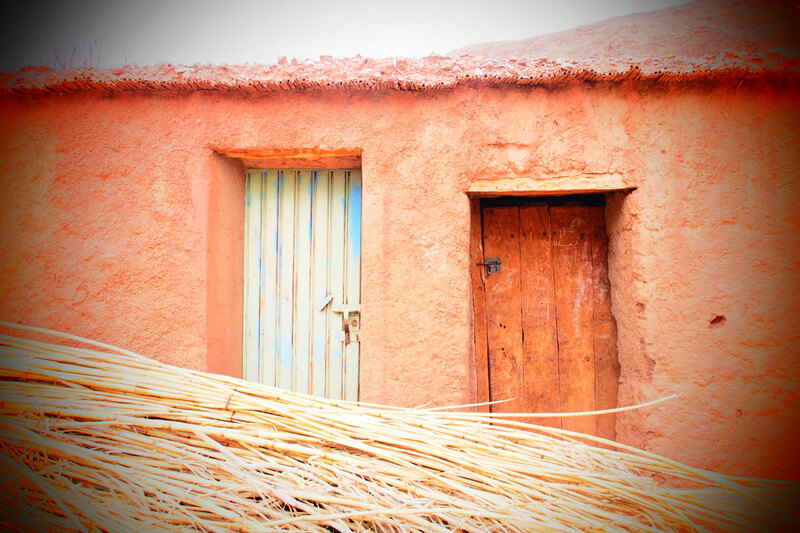 We are on a tight time schedule and Brahim whisks us off to the Nomad Depot – where Berber rugs prevail and the salesmen are smooth as glass. Many teas later (was the tea drugged?) and several hours as well, we exit the Nomad Depot, in a stupor, having each just bought some rugs we undoubtedly did not need but they are quickly on their way by fast boat to our respective homes. We have many many hours left in the car before Marrakech, we receive disturbing news from Brahim’s boss, they need to pull him from us to lead another tour, he is evidently the best and the most knowledgable, so he will have to trade us off to another driver, later in the day. We are upset, as we don’t want to sever our connection with Brahim one second sooner than we have to, but it is out of all of our hands. Our mood is a little subdued for the rest of the journey. We make the best of it, stop for excellent espresso in the sun, all the sun tables are taken , so Brahim gets the owner, his friend, to create a makeshift table in the parking lot. Much better than the standard tables where the rest of the tourists are sitting. 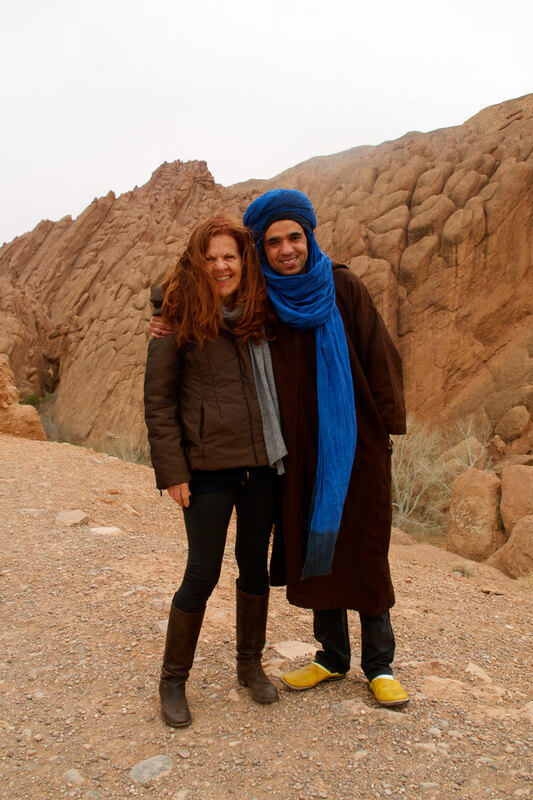 Our last few moments with Brahim, a stop to look at the view and a Kasbah, and to make friends with some kids and their puppy. It was a teary and emotional departure. Stay tuned for Part 2. Arriving soon. Ms. Stac, I love it! What a travel log you have darling! I am enjoying the trip with you. Your descriptions are so colorful and take one away along with you. I feel as though I have been swept away to the Sahara along with you. What an incredible adventure! Wheeeeeeeeeee. So fun to be on this ride with you (in photos and words). Love it!